I was mesmerized the first time I saw a Loggerhead Sea Turtle. Even though I was born in Florida and have visited the Georgia and Carolina coasts over the years, I'd never seen a live Loggerhead...it was an exciting event. As much as I'd seen on television about the Loggerhead, it was at Georgia Aquarium that I really "learned" about them. For example, it's believed that these guys can live to more than 100 years old...that of 1,000-10,000 hatch-lings only one grows into adulthood...and most fascinating, this species was swimming Earth's oceans when the dinosaurs roamed the planet! Being an avid tourist has its benefits...I find that I've learned an awful lot. Not only about my beloved Atlanta, but about our world, our culture, our history, as well as where we're headed. I hope you have at least half as much fun as I do exploring our city. Enjoy the above pre-sized Facebook Cover Photo then head over to wanderlust ATLANTA's Facebook Page for more! The annual Dragon*Con convention begins in less than two weeks and the Dragon*Con Parade is two weeks from today! Did you know that this convention draws 40,000-50,000 people? Did you know that it takes four host hotels and a lot of spill-over hotels to accommodate the convention? Did you know that area attractions host Dragon*Con conventioneers for special events every year? Bottom line...this convention has a significant impact on Atlanta's bottom line. And it's some guaranteed good entertainment! Whether you don pointy ears, antennae, or no ears at all...Dragon*Con is just plain fun. Wondering why else you should consider attending? There are celebrity-led panels—lots of them, there are contests, there are parties, there are workshops, there's a huge retail space, there's community outreach programs, there's LOTS of opportunity for photos you'll be showing off until the next Dragon*Con, and there's excellent celebrity spotting...there's just too much to list here. Check out their website! Hoping to see more Andorians...they're just plain fun too. Head over to the wanderlust ATLANTA Facebook Page for more Dragon*Con photos and recaps. There are more opportunities to see incredibly unique animals in Atlanta than anywhere I've been before...and I've seen a everything from a Toucan in the Argentine jungle to Moose in the Rocky Mountains of Wyoming...and a few other things I have no idea what they were. Alligators are no stranger to the southeast United States, but it's not every day that you get to see an albino alligator! This one resides at Georgia Aquarium with one other. There are fewer than 50 of these guys living in the United States, so a rare viewing opportunity indeed! There's a LOT to see at Georgia Aquarium—the largest Aquarium in the world!—so head over and explore lake, rive, sea, and ocean life from around the world! Ask about their education and conservation efforts while you're there. Then head over to the wanderlust ATLANTA Facebook Page—"Like" it while you're there, please—and enjoy the other information, photos, and video posted there! One of the highlights of summer plants at the Atlanta Botanical Garden is its water plants, particularly their wide variety of water lilies. From the American Lotus to the 5-foot wide pads of the Victoria water lily, the Garden provides a gorgeous display year after year. Remember, tonight is "Cocktails in the Garden", an Atlanta summer tradition for the last decade! It's a great outing for a group of friends and a brilliant idea for date night! Enjoy the above pre-sized Facebook Cover Photo then head over to the wanderlust ATLANTA Facebook Page for more! It's going to be a very, very busy week at work, so more photos and less talk this week. Enjoy this pre-sized Facebook Cover Photo of one of my more favorite mummy coffins that's part of the permanent collection at the Michael C. Carlos Museum. If you're anywhere near the Emory campus, this guy is in your back yard! Remember, head over to the wanderlust ATLANTA Facebook Page for lots more! Fortunate for us city-dwellers, as well as visitors from near and far, Atlanta is not at all shy on festivals. One of my favorites is coming up soon...the Atlanta Arts Festival! Now then, you'll hear people say, "I might go, but they have the same stuff year after year." I charge that those who utter such nonsense could use a renewed sense of adventure. True, there are some artists who a "regulars" at some of our festivals, and for some that's a good thing. Personally, I love it when Greg Stones attends any of our festivals. Greg is a watercolor artist with a unique sense of humor who visits us all the way from Rhode Island. I love his work that I've seen and am always excited to see his new work. One of the most fun aspects of a festival is the people-watching. Atlanta always delivers when it comes to animated scenarios, a plethora of fashion expressions, and some pretty sweet 'eye candy' from time to time. And nothing beats the joviality that a festival brings...not to mention, they're a great excuse to get out of the house! The Atlanta Arts Festival is usually the second weekend after Labor Day making this year's Saturday and Sunday, September 15-16. The artist line up looks rather impressive...and yes, Greg Stones will be there! What is it about Greg you ask? He totally reminds me of Douglas Adams...an American version of course, but I see a remarkable parallel in their writing styles...and Greg paints too! Enjoy the above pre-sized Facebook Cover Photo, a shot I took at a previous Atlanta Arts Festival, and then head over to the wanderlust ATLANTA Facebook Page to explore further! On a day as gorgeous as today was, there's nothing quite like a relaxing Sunday Drive. 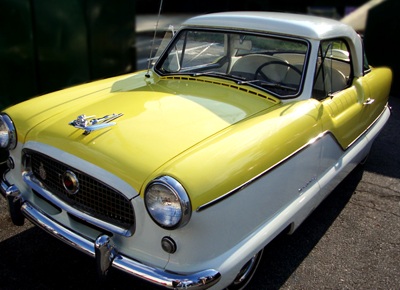 Now, imagine doing it in a Nash "Metropolitan" Series III in "Sunburst Yellow" and contrasting "Snowberry White". There's certainly no shortage of car clubs and car shows in Atlanta. And until we live in a world with all electric cars or 24th Century transporters, I find myself among those who are fascinated with cool old cars and futuristic concept cars. The hood ornament in the above photo was first introduced in 1955 with the launch of the "Metropolitian" Series III. The Metropolitian was also one of if not the first "compact" cars in the United States...a departure from the "bigger is better" designs of the times. Enjoy the above pre-sized Facebook Cover Photo and then head over to the wanderlust ATLANTA Facebook Page for others. Please "Like" and share the Page while you're there! The annual Dragon*Con Parade is only three weeks away! The Parade will kick off at 10:00 a.m. on Saturday September 1, 2012...and my experience has been that they always start on time. My friends, family, and others who know me, know that I'm a huge sci-fi enthusiast...HUGE! Oddly enough, I'd never attended a sci-fi convention until a couple of years ago. I'd wanted to, it just never worked out that I got to. That changed Labor Day Weekend 2010. Dragon*Con 2010 and the Dragon*Con Parade 2010 were life-changing. Nah...no epiphanies that changed the way I live or anything like that, but I'd discovered a new level of fun, celebrity spotting (which I love! ), and that there are a lot more fellow sci-fi enthusiasts in Atlanta than I ever though. To give you an idea of the scope of a Dragon*Con Parade, last year's Parade (2011) was comprised of 3,100 participants who overtook a huge strip of Peachtree Street...that's people "in" the Parade, not the thousands of cheering, camera-clicking, video-recording spectators. Whether you attend one or all four days of Dragon*Con on Labor Day Weekend or the Parade (which is free) that Saturday, you're guaranteed to have an experience that's rather unique in Atlanta. Enjoy the above pre-sized Facebook Cover Photo and then head over to the wanderlust ATLANTA Facebook Page. Like and share the Page while you're there! If you've ever had the privilege of attending an event (or even better, hosting an event) in the Egyptian Ballroom at The Fox Theatre, you've experienced the remarkable grandeur of the 1929 architectural marvel. I've discussed The Fox Theatre before...I guess my childhood fascination with Ancient Egypt brings me back to it again and again. It's certainly no less fascinating today. With its 25' ceilings (and 30' clerestories! ), the 90' by 76' ballroom is impressive indeed! The relief in the above image—featuring a Solar Disk (representing the sun god Ra), cobras, and wings—is on the face of the balcony, which runs the width of the ballroom. This symbol is repeated throughout the room, once over the main stage and flanking all sides of the room in the carpet. The room is stunning and even more so when set for an event. Enjoy the pre-sized Facebook Cover Photo above and be sure to visit the wanderlustATLANTA Facebook Page! You know, one of the things I love about Atlanta is its architecture, especially her skyscrapers. As a matter of fact, for the nine years I lived in D.C., and many of my friends will attest to this, one of the major things I missed was a skyline. So, you can imagine my delight when I returned to discover that ours had grown as beautifully as it had exponentially. But, how about this...we all know that there are more than 60 streets in Atlanta that contain the word "Peachtree", right? Do you know how many buildings in Atlanta contain the name "Peachtree"? Go on, take a wild guess. Of only the buildings in Atlanta that are more than 25 stories tall, there are 12 buildings that contain the name "Peachtree"! Amazing, right?! 1180 Peachtree (41 stories) - above photo! That's a lot of Peachtrees! And I love "Peachtree", but if another developer announces a building name that's no more creative than the building's address, I swear I'm going to launch a Change.org campaign! Not really, but c'mon...a little more creativity, please. Your buildings are gorgeous...they deserve a more than a common street address name. Just sayin'. Well, enjoy the above pre-sized Facebook Cover Photo...and there are more architectural Covers coming in the near-term. In the meantime, head over to the wanderlust ATLANTA Facebook Page to enjoy other Covers and stories. I can hardly believe there's less than two months of baseball season remaining...I'm already missing the Atlanta Braves just thinking about it. I just checked the Braves schedule and the last home game is Sunday, September 30 in a challenge against the Mets. That'll be a fully charged game! Don't worry...this isn't what the stadium looks like on game day. I actually took this during a behind-the-scenes tour--which was fantastic! Our tour guide was totally engaging and "hit a home run" with all who were on the tour. Also, many of the enjoyment opportunities available to fans you may not learn about for a long time without having gone on a tour...the misters at Coca-Cola Sky Field, for instance. That's something you'll appreciate knowing about on those blistering hot days! As a matter of fact, the Braves offer visitors 101 Things to Do while at Turner Field. Get you tickets to a Braves game and enjoy the above pre-sized Facebook Cover Photo. When you're done here, head over to the wanderlust ATLANTA Facebook Page for more! Known as the "People's Capitol," the Georgia State Capitol Building is open to her citizens and it houses a fascinating museum filled with wonders from throughout the state. The Georgia Capitol Museum has been housed on the fourth floor of the Georgia State Capitol Building since 1890 and includes artwork, flags, and material culture, as well as a few oddities such as a Georgia-born two-headed cow. The collection on display is impressive! Group tours are available and I highly recommend them. Note that the tour schedule changes frequently (they do have a State to run) and must be scheduled in advanced. Self-guided tours are also available and do not require a reservation, but double-check the days and hours before heading to the Capitol Building. While you're there, be sure to stop by the Hall of Valor located on the first floor. This must-see "displays Georgia's priceless collection of 82 historic flags from the early Georgia militia, the Civil War, the Spanish American War, World Wars I and II, the Korean War, the Vietnam War, Operation Desert Storm and Operation Iraqi Freedom." And there's the Capitol Grounds, which has lots more to explore, including the Capitol cornerstone, lots of statuary, the Gold Dome and Miss Freedom (pictured above). Enjoy your visit to our Capitol Building and enjoy the above pre-sized Facebook Cover Photo. Then head over to the wanderlust ATLANTA Facebook Page for lots more. A stroll through the park is a lovely idea for a Sunday. Personally, I'm inclined to theme my activities, parties, photos, etc. So, with what's happening in London at the moment, how about taking today's stroll through Centennial Olympic Park? 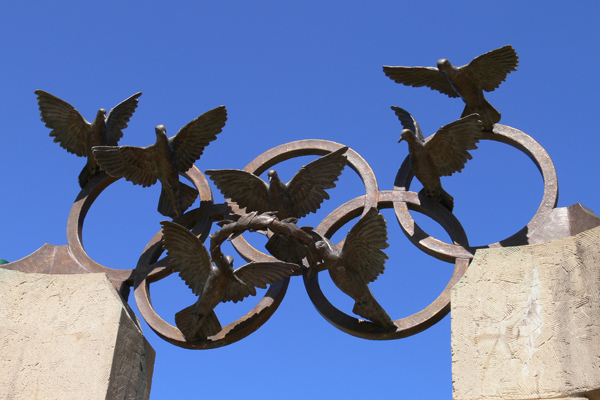 Centennial Olympic Park is one of our brilliant legacies from the 1996 Summer Olympic Games, which was also the 100th anniversary of the modern Olympic Games. just a short walk away is The View on the 72nd floor of the Westin Peachtree Plaza. Visitors to Centennial Olympic Park are also in the midst of downtown, so there are plenty of shopping, dining, and people-watching opportunities. Back to the Park. In this photo is the "Quilt of Nations," which depicts the flags of all nations that competed in the 1996 Games. There are also fountains, statuary, sculpture, a playground for the youngsters, a concert venue, concession stands, and during the winter, there's even an ice skating rink! You know what? Today is "International Beer Day" and Der Biergarten is a block from the Park, so if you're so inclined, there's an idea for you. Enjoy the pre-sized Facebook Cover Photo...it's yours to use as you wish. When you're done here, please head over to the wanderlust ATLANTA Facebook Page and "Like" it, then explore...there's lots there! The Dorthy Chapman Fuqua Conservatory opened in 1989 at the Atlanta Botanical Garden to great fanfare. It was made possible by a gift from prominent Atlanta businessman, J.B. Fuqua. As the story goes, Mr. Fuqua approached the Garden's executive director, at the time that was Ann Crammond, and asked what would put the Atlanta Botanical Garden "on the map." Ms. Crammond's immediate answer was "A conservatory!" Mr. Fuqua proposed a $3 million gift. After exploring other conservatories, it was determined that $3 million would be enough to construct a conservatory, but it would be one of the smallest in the country. Mr. Fuqua very generously increased his gift to $5.5 million dollars! Visitors who attend Cocktails in the Garden or Garden Lights have the unique opportunity to hear something daytime visitors never do. While during any visit you can hear the myriad of creatures contributing a sensory experience in the way of sound, at night, when the sun goes down, the volume goes way up! So, when you're there for an evening event, be sure to take a stroll through the Conservatory. The Conservatory is a must-see, must-experience during any visit to the Garden. And if you'd like to see Dorothy herself, there's a gorgeous portrait of here just inside the Orchid Center as you enter from the Edible Garden. This photograph was taken from inside the Crape Myrtle Allee. In the foreground is the Promenade Fountain and Howell Plaza; in the middle ground is the Great Lawn—sight of concerts, galas, and Tai Chi classes; and the Conservatory in the background, with a bit of Atlanta's skyline peeking over the top. Enjoy the pre-sized Facebook Cover Photo and visit the wanderlust ATLANTA Facebook Page for more! If you were to tell a friend what you like best about wanderlust ATLANTA...what would it be? Atlanta has had a lot of stars in town this summer...movie-making galore! But there are other stars who are here all the time and always will be...and you don't have to have a Hollywood connection to see them. A visit to the Fernbank Science Center's Observatory and you can see the most brilliant stars, planets, and the occasional full moon...and while they don't give autographs, star-gazing tends to be much more romantic than celebrity-spotting! Part of the Dekalb County Public Schools system, the Fernbank Observatory is open to visitors--for public viewing--Thursday and Friday evenings (weather permitting) to see the night sky. It's free of charge and is open 9:00 p.m. to 10:30 p.m. The viewing is hosted by a astronomy professional, usually someone who is enthusiastic about their particular field, enhancing the experience all the more. If you want a more comprehensive visit, for only $4, there's a planetarium show immediately preceding the opening of the Observatory. If you really want to impress your friends and/or date, visit the Fernbank Science Center's website to review "This Week's Sky at a Glance" to see what's visible in the current sky. For example, this week, about an hour before sunrise, Betelgeuse, Venus and Jupiter are visible in the east and shortly after sunset in the east and straight up, Vega is the brightest star. Just so you know, the Fernbank Science Center is not part of the Fernbank Museum of Natural History, so if making plans to meet there, be clear on which "Fernbank" you're visiting. Enjoy the above pre-sized Facebook Cover Photo and then head over to the wanderlust ATLANTA Facebook Page and "Like" it, please, and check out the other Cover photos and Atlanta happening! This Cover Photo (for Facebook) is re-purposed from a post I did a couple of years about Fernbank Museum of Natural History. This electrified sphere is equally fascinating to kids and adults...it's part of the permanent exhibit "Sensing Nature." I just got home from the Atlanta Botanical Garden, volunteering for Cocktails in the Garden, where it rained a great majority of the evening. I've NEVER see it rain like that at the Garden (just lucky, I guess), but tonight it did...and there was lightening, which is why I wanted to post this particular photograph. I'm not going to go on and on tonight, but wanted to say that a trip to Fernbank, even if only to see the permanent exhibits, is worthy of top-of-list status...and even more so if you have kids. Please enjoy this pre-sized Fernbank photograph. 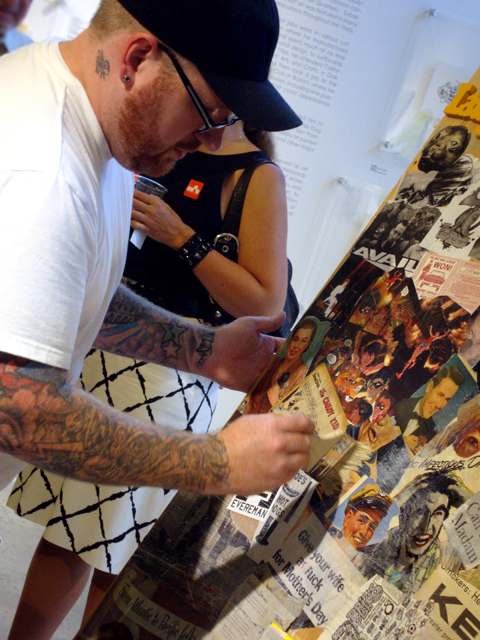 Then head over to the wanderlust ATLANTA Facebook Page where you'll find lots more! Please "Like" the Page while you're there!